Jenny Sabin Studio’s “Lumen,” winner of the Museum of Modern Art’s 2017 Young Architects Program, has made its debut in the MoMA PS1 Courtyard in New York City, where it will play host to the 20th season of Warm Up, MoMA PS1’s pioneering outdoor music series. Constructed from more than 1,000,000 yards of “digitally knitted and robotically woven fiber,” this year’s structure features 250 hanging tubular structures designed to capture and display the ever-changing color of sunlight over the course of the day. “Socially and environmentally responsive, Lumen’s adaptive architecture is inspired by collective levity, play, and interaction as the structure transforms throughout the day and night, responding to the density of bodies, heat, and sunlight,” explains MoMA PS1. 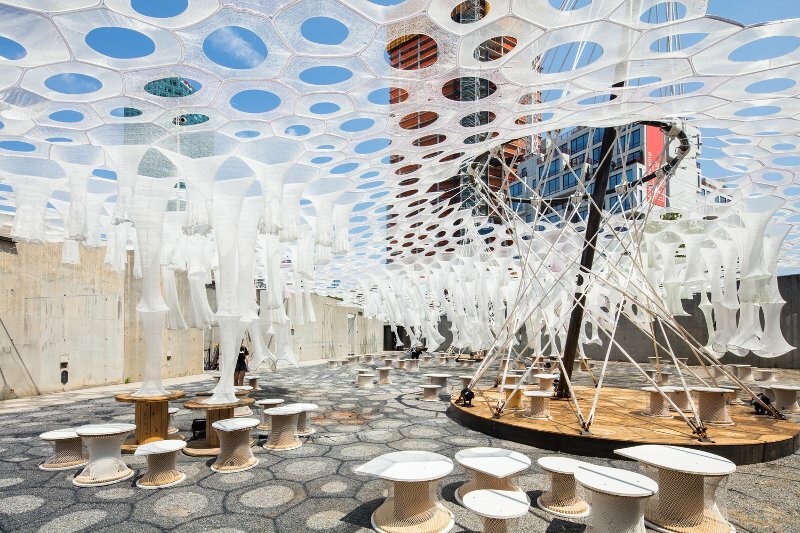 Beneath the canopy, 100 robotically woven recycled spool stools and a motion-detecting misting system will allow visitors to relax and cool off out of the heat of the hot New York summer. The other finalists for the 2017 MoMA PS1 Young Architects Program were Bureau Spectacular (Jimenez Lai and Joanna Grant), Ania Jaworska, Office of III (Sean Canty, Ryan Golenberg, and Stephanie Lin), and SCHAUM/SHIEH (Rosalyne Shieh and Troy Schaum). An exhibition of all 5 proposals will be on display through the summer at The Museum of Modern Art. Previous winners of the Young Architects Program include Escobedo Soliz Studio’s Weaving the Courtyard (2016), Andrés Jaque / Office for Political Innovation’s COSMO (2015), The Living / David Benjamin's Hy-Fi (2014), CODA / Caroline O'Donnell’s Party Wall (2013), HWKN’s Wendy (2012), Interboro Parners' Holding Pattern (2011), SO-IL's Pole Dance (2010), MOS' Afterparty (2009) and Work AC’s Public Farm 1 (2008).